Other photos: Photo 1, Photo 2, Photo 3, Photo 4, Photo 5, Manufacturer Provided Image, Manufacturer Provided Image, Manufacturer Provided Image, Manufacturer Provided Image, Manufacturer Provided Image, Manufacturer Provided Image, Manufacturer Provided Image, Photo 13, Photo 14, Photo 15, Photo 16, Photo 17. Sea Ray’s "out-of-this-world" 55 Sundancer is an amazing yacht. The wow features are endless, beginning with an upper-deck sunroom with two retractable sun roofs, teak flooring and a 360-degree panoramic view. The yachts features an elegant salon with state-of-the-art entertainment center, two luxurious staterooms and a wealth of gracious amenities throughout. This 2009 55 Blue hulled Sundancer is in wonderful condition. This is a one owner shed kept yacht with low hours. This boat has twin 900 MAN diesels with 650 hours on them. She also has twin Raymarine E120 at the helm and the overhead Man displays. There is also night vision Flir installed. Also, at the helm are the auto pilot and controller for the bow and stern thrusters. Just aft of the helm is a great seating/dining area which has a great round table with a full adjustable side to side U shaped settee which allow you to either dine with friends or simply enjoy your favorite TV show. Opposite the seating area is the wet bar with storage and an ice maker and to the rear of all of this is a great outside space with additional seating and a Kenyon electric grill and refrigerator for those times you want to cook out. At the transom, is the hydraulic swim platform and dingy cradles. The cabin offers an amazing galley with Sub Zero refrigeration and freezers, washer/dryer, convection oven and lots of storage. Opposite the galley, is the Starboard settee which faces a large screen TV for your viewing pleasure while below. There is a full beam Master cabin which includes double facing settees with a table between for a private beverage in the evening or breakfast in the morning. The master queen-sized bed is adjustable so you can relax while watching a show on your in stateroom TV. There is a refrigerator for your beverages also. The master head with separate shower has tile floors and is very well layed out. The forward VIP guest cabin is spacious with lots of storage and has its own head and shower which are also accessible from the hall. Please call for an appointment to view. SYS Yacht Sales is pleased to assist you in the purchase of this vessel. 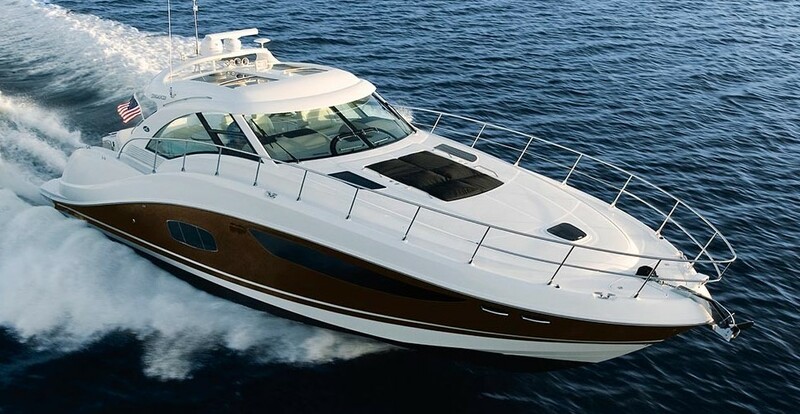 This boat is centrally listed by Thunderbird Yacht Sales.